Before I go on to share some really beneficial home remedies to remove acne scars naturally, I want to share some words of wisdom. There are certain things that you should avoid in order to prevent forming scars in the first place. It’s not essential to have scars even if you get pimples! There are various natural ingredients that you can apply to scars to remove scars from your face. Add ½ tsp of cinnamon powder with 1 tbsp of honey and apply to scars. Leave it for an hour. You can even use it overnight. Then wash off. Put the aspirins in a few drops of water till they get dissolved into it and form a paste. Don’t use too much water as you need a gritty texture for exfoliation. Baking soda is yet another popular remedy for removing acne scars through its exfoliating effects. The gentle coarse granules of soda mixed with water remove the dead skin layer off your face without any inflammation caused by the application. Derived from the Melaleuca alternifolia plant of Australia, tea tree oil is an excellent antiseptic, antibacterial, antifungal and antiviral essential oil. As such, not only for acne scars, tea tree oil is, in fact, one of the best remedies for acne too. As far as scars are concerned, this oil is most beneficial in healing the hypertrophic scars that are generally raised and red, such as those we get after burn injury or a surgery. Raised acne scars too are not very uncommon. So if you have such raised or hypertrophic acne scars, you can effectively use tea tree oil to heal them. Tea tree oil, due to its anti-inflammatory effects would definitely help you in getting rid of such acne scars. This oil is also hydrating. It provides moisture and helps hydrate the scar which gradually diminishes the scar and make it disappear. Apple cider vinegar has many properties. It is an astringent and a natural disinfectant that makes it a good natural antiseptic. It also balances the pH level of your body and of your skin when applied topically. And because it is anti-bacterial and anti-inflammatory, it is effective in the treatment of acne too. All of these properties of apple cider vinegar are granted by its beneficial components that include vitamins, minerals, carbolic acid, ketones, aldehydes, amino acids, anti-oxidant, acetic acid and many more. It is therefore a known remedy for acne. You can also heal acne scars considerably with apple cider vinegar. As this vinegar scrapes off the dead skin cells, it may fade away the acne scars to a great extent. You can either use apple cider vinegar with water or with honey. Precaution: If you have a sensitive skin, you should always do the patch test before applying vitamin E oil or any other oil on to your skin. Cocoa butter, the fat derived from cacao seeds, is an excellent natural moisturizer and due to its moisturizing properties, it not only heals scars but also prevents them. But does cocoa butter remove acne scars? Yes, it can of course! Let’s know how it does it. How does cocoa butter remove acne scars? Cocoa butter softens and moisturizes your skin. Apart from this, it also smoothes out the tone and texture of your skin. This makes your acne scars less noticeable. At night, before going to bed, wash your face properly and pat it dry. Take some cocoa butter and apply this to your face gently massaging it onto your skin for a couple of minutes. You may also apply cocoa butter once more during the daytime. Only do not apply too much of it as you may do at night. This will keep your skin looking greasy. Keeping your skin well hydrated and moisturized is the first step towards removing acne scars. Cocos butter is perhaps one of the best natural moisturizers that you can use on your skin to not only get rid of acne scars but also to keep your skin soft and smooth! Q: Do all acne scars go away? (OR) Do all scars fade? Ans: No, the scars will not fully disappear why because scars are formed when the skin gets damaged in the dermal level in which the new skin cells originate in this layer. As time goes, the body heals the wound by creating new collagen fibers and this repair of damaged tissue results in a scar. Q: What causes acne scars? Ans: When the follicle or pore becomes clogged due to excess oil, bacteria and dead skin cells then the pores swell by causing a break in the follicle wall. If the rupture occurs near the skin’s surface then lesion will be minor and gets healed quickly. Then this infected material extends into the dermis and destroys the healthy skin tissue then it forms scars on the skin. 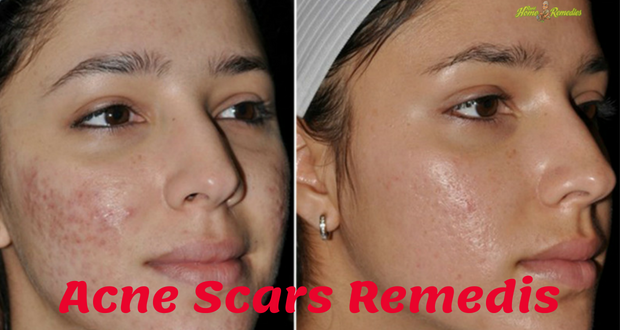 If these scars are not treated properly then there is a chance of getting the acne back in that affected area. Other reasons include genetics, picking or popping or touching the pimples, hormonal imbalance, stress and improper skin care. Q: How do you get rid of acne scars? Ans: There are various natural remedies that help you a lot in getting rid of acne scars. Here are a few best remedies for clearing these acne scars. Along with these remedies, take proper care on your skin, drink plenty of water, consume a healthy diet and perform some regular exercises. Q: Is bio oil good for acne scars? Ans: Yes, bio oil works well in fading the acne scars due to its large content of plant extracts. It is designed to improve the skin from stretch marks, acne scars and other skin imperfections. This oil works as an emollient that aims at reducing the appearance of acne scars by simply keeping the skin hydrated. It won’t clog the skin pores and gets easily absorbed into the skin. This oil-based skin care product will keep out oxygen and leave moisture and vitamins on the skin to reduce the redness and appearance of scars. Simply apply it twice daily on the scars to fade them completely. Q: Can dermatologist get rid of acne scars? Ans: Yes, dermatologist can help you to get rid of acne scars with various modern treatments like laser resurfacing, dermabrasion, fractional laser treatments, skin needling, dermal fillers, chemical peel, intralesional injections, punch excision and subscision surgery, cryosurgery, etc. in which you’re dermatologist will suggest the treatment as per the effect of acne scars effect on the skin. Q: Are acne scars really permanent? Ans: Acne scars are permanent why because it causes damage to the collagen deep in the skin. However, it depends upon the type of acne scar left behind and the skincare you’re taking but you can fade and slowly remove the acne scars on the skin with some natural remedies and cosmetic treatments over a period of time. Q: Is chemical peel good for acne scars? Ans: Chemical peels (or alpha-hydroxy acid, AHA or beta-hydroxy acid, BHA) will exfoliate the skin and eventually peel off to make it smooth and glow with an even skin tone. Yes, for certain cases of acne scars, chemical peel works well in fading them from the skin. Be sure to consult your dermatologist before undergoing the chemical peel treatment why because it includes some side effects like redness, irritation and swelling due to the usage of different acid solutions. Q: Can lemon remove pimples? Ans: Yes, lemon is very effective in removing pimples. It has a mild astringent property that reduces the oil production and tightens the skin. The vitamin C rich content will trigger the collagen production and thereby encourages the formation of new skin cells. Its natural bleaching property helps to reduce the appearance of acne marks on the skin. It exhibits antibacterial, antimicrobial and anti-inflammatory properties that help to clear the bacteria (causing acne or pimples), reduces redness and swelling. Make sure that not to steep out in the sun after an hour or two of applying lemon juice on the skin why because it causes photosensitivity and make your skin looks dark. Q: Which cream is best for pimples? Ans: Although, there are various products or creams available in the market for treating pimples/acne, here we are mentioning some creams that work best for removing pimples. Q: What is acne scars? Ans: Acne scars occur as a result of inflamed blemishes that are caused due to clogging of skin pores with excess oil, bacteria and dead skin cells, which makes the skin pores to swell and thereby causes a break in the follicle wall. If it causes deep break then it causes damage to the surrounding tissue by creating deeper lesions. So, acne scars are the permanent textural changes that are caused due to severe acne on the skin. However, the formation of new collagen fibers in the skin will help to repair these lesions but it won’t be as smooth as original skin. Atrophic or depressed scarring – This is a most common type that is formed when there is not enough collagen is made by the skin while the wound is healing. You can notice three types of atrophic scars like a boxcar, ice pick & rolling. Boxcar – These are depressed scars that are usually round or oval in shape with steeply angled sides and they are deep or shallow. Ice Pick – They are narrow, V-shaped scars that go deep into the skin. These are most difficult scars to treat among other types why because it extends far under the skin’s surface. Rolling – These are wide depressions with round edges which are irregular and have rolling appearance. Hypertrophic or raised or keloid scars – These scars are formed commonly with back and chest acne. They result in a mass of raised tissue on the skin’s surface due to too much production of collagen during the healing process. You can also find other types of acne scars like mixed acne scars, macular scars and lumpy hypertrophic scars. this sounds so good loved it. tnx for d info. . .
thank u,..for the good information I will try all of this info thanks again and God bless,..
very good i read this for home remedies i have problem about. my face coz have a drk spot. Im using China cream but gone.. im glad to read this. Now im trying to use potato 2X daily i make..i. hope this is b-come good.Thanks. what if i mix the potato, honey and lemon alltogether? Wow amazing,its good to learn. dnt ever try baking soda if u have a sensitive skin it will result irritation,swelling and creating a red scar around ur face.i have tried this a few minutes ago,and my skin has burned.!!!!!!!! Has anyone tried any of the remedies and how long does it take to get rid of the dark spots? Yes, Aloe vera is a wonder plant to treat acne scars. Massage your face with aloe vera gel for 2-3 minutes over the affected area and leave for 15 minutes. Acne scars will banish in couple of days. plz tel me that wha'ts duration for apply this Tips?? I will try lemon juice.i just started 3 days ago.26 of august.i have few acne scars but mostly on my chin . very worst.due to on and off acne. how if i feel itchy on my face skin? waht should i do .. I tried many of the natural remedies to remove pimples but none of them worked for me. Then I used Truskin, which removed all the pimples and cleared my skin perfectly, try it to have a clear skin.